Plan a weekend trip to one of these romantic Illinois inns to relax and rejuvenate surrounded by nature. Whether you are looking for a spa getaway, wine tasting vacation, honeymoon suites, or ideas for foodies, there are many beautiful places to choose from, some of which are just a short drive from Chicago. Many of the inns that made our list have a unique history and all are known for their welcoming ambiance and outstanding service. Here are the best romantic getaways in Illinois. 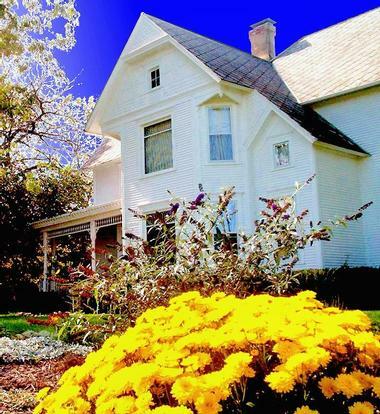 The Goldmoor Inn is the only bed and breakfast in Galena with stunning views of the Mississippi River and one of the best best romantic getaways in Illinois. You can choose to stay in a room with a whirlpool or a private fireplace. There are 13 romantic deluxe suites within the Castle as well as two log cabins along the bluff and three country cottages. All accommodations have personal decorations with cozy, period elements. The cottages and the log cabins have private porches, galley kitchens, fireplaces, dining areas, and whirlpool tubs. Each suite is unique with cozy fireplaces, luxurious whirlpool tubs, and hand-carved furniture. The Chestnut Street Inn is one of the top bed and breakfasts for foodies or those who truly enjoy a gourmet meal since the menus are inspired by Mediterranean dishes and made with locally-sourced ingredients. The 1854 historic home has multiple guest rooms with their own private bathrooms, DVDs and VCRs, dish network, bathrobes, Wi-Fi, and signature toiletries. There is also central heating and air conditioning, bottled water, blow dryers, irons with ironing boards, snacks and beverages, and bottled water. During your visit, you can enjoy a cooking class. There is a patio with areas to sit and read or have a drink, as well as a fireplace and a DVD library with more than 1,000 titles. Breakfast is included with an overnight stay and there is also a prix-fixe dinner available. Breakfast changes daily but may include vegetable frittatas, Spanish omelets, cheese and egg soufflés, hotcakes, or similar dishes. You can also have chocolates wine, and beer. If you are looking for affordable romantic getaways in Illinois, rates start at $119 per night. This is the ideal inn for those who enjoy a glass of wine and want to combine a relaxing getaway with a vineyard and winery tour. The inn itself can accommodate couples looking for romance, friends celebrating, business trips, or staycations. There are four rooms to choose from, each of which has a semi-private bath and gives you access to the Pinnacle Country Club Dining. Every stay includes a complimentary wine tasting and you get preferred pricing at the winery. The day begins with a Good Morning breakfast and guests can relax in the on-site hot tub, sit on the patio and enjoy the expansive view, or sit in the foyer. There are two main packages to choose from, one of which gives you a full breakfast in addition to the accommodations and the other includes a light continental breakfast and a bottle of wine. You can also select a package that includes golf, spa services on-site, or skiing at a nearby winter sports park. Rates start at $125 per night. Copperstone Inn is located on the Orchard Ridge Farms and surrounded by natural beauty. This luxury bed and breakfast has been hosting guests on 130 acres of land since 2008 although the building dates back to 1858. There are seven romantic suites at the inn, each with their own unique appointments such as private entrances, patios, private baths, claw foot tubs, fireplaces, sitting areas, Jacuzzi tubs, and flat-screen TVs. All rooms have access to inn amenities, including the luxury linens, iPod docks, in-room safes, satellite TVs, free parking, free Wi-Fi, and turn down service. The inn has a spa where you can enjoy massage therapy, a manicure or pedicure, couples’ massage, or one of many skincare services. There are also personal yoga sessions available. If you are looking for romantic spa getaways in Illinois, Copperstone Inn is a great affordable option with rooms starting at $199 per night. This bed and breakfast is quiet and relaxing with easy access to Oak Park and Chicago. The “L” train is only a few blocks away. There are five romantic suites, including two penthouse suites. Amenities include slippers, deluxe robes, hand-pressed sheets, private baths, refrigerators, central air conditioning, Wi-Fi, blow dryers, cable TV with DVD players, irons, Aveda toiletries, towel warmers, and full-length mirrors. Some rooms also have oversized Jacuzzis for two people, fireplaces, chaise lounges, marble baths featuring soaking tubs, antique furniture, kitchenettes, 12-foot ceilings, rain showers, and stained glass windows. Breakfast is an informal, flexible meal with a friendly atmosphere, baked goods, and hot entrees like pancakes, French toast, and egg cups. You will find a comfortable sitting space in the common area along with a fireplace. 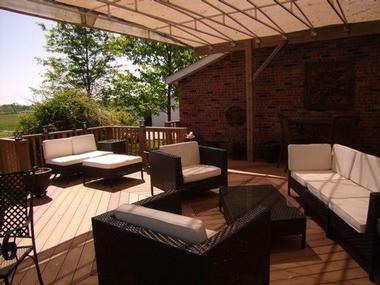 If you are looking for romantic suites in Illinois, rates start at $250 per night. 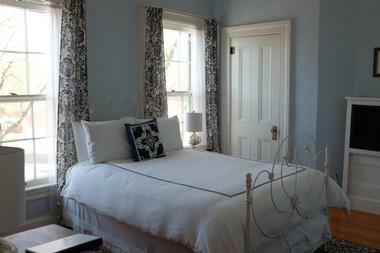 The turn-of-the-century suites and rooms at the Inn at 835 combine modern comforts with historic decorations. They include private baths, plush towels, hand-milled French soap, cable TV, state-of-the-art telephones, Wi-Fi and high-speed wired internet. The main building offers a choice of eleven guest rooms while the Bell House has two more suites. There are also extended-stay suites available for between one and six months. These areas are larger, with a living room, separate bedroom, kitchen, and extra room. The day begins with gourmet tea or coffee and a breakfast served-to-order. There is wine available at night. You can customize your stay with flowers, champagne, a special turndown service, or cheese and fruit. If you are looking for romantic getaways in Illinois with affordable rates, you can stay here starting at $132 per night. The Cornerstone Inn is a 19th-century inn with modern amenities and is part of the National Register of Historic Places for its Italianate architecture and banking history. Every guest room is comfortable with its own private bath. You also get a pillow-top bed, individually-controlled heating and central air conditioning, Wi-Fi access across the property, a flat-screen TV, DVD player, custom toiletries, irons, and hairdryers. Some rooms also have wicker furniture, whirlpool tubs with showers, and antique brass beds. Guests have access to the free DVD library, free parking, and bottled water with ice. There is also a pub and restaurant on site so you never have to leave the inn unless you want to. The morning starts with a complimentary full breakfast. Rooms start at $100 per night. You may also like: 25 Must-Try Romantic Restaurants in Chicago. This luxurious bed and breakfast doubles as the perfect wedding venue and is close to historic Galena. The rooms have fine plush robes and all buildings are air conditioned and heated. There are multiple types of rooms, including those that welcome pets and/or children and those which are ideal for a romantic getaway. Room amenities vary but may include flat-screen TVs, DVD players, mini fridges, CD players, fireplaces, two-person whirlpool tubs, and sleeper sofas. Guests can stroll through the well-maintained gardens. The on-site library has books, magazines, games, and DVDs as well as coffee, tea, cookies, and popcorn. The complimentary breakfast begins with fresh fruit, eggs that are made to order, and a signature entrée like Belgian waffles or French toast. There is also tea, coffee, juice, farm-fresh meats, breads, and seasoned potatoes. The inn is able to accommodate those with special diets as well. Rooms start at $125 per night. Guests can complement their stay with a romance package or an in-suite spa massage. You can enjoy breakfast right in your suite at the convenient table and chairs. Every suite has its own coffee maker and you are able to customize your breakfast. There are also landings where groups can enjoy breakfast together. Rates start at $140 per night. This relaxing bed and breakfast is in a historic river town between Mississippi River bluffs, a short drive away from larger cities. Every room is smoke-free and has a private bath, free wireless internet, a flat-screen TV, a DVD player, a coffee maker, a refrigerator, a sitting area, and a desk. There are five rooms to choose from, each with a unique décor and although rates are based on double occupancy, some rooms can sleep extra people. Guests can explore the miles of nearby trails on foot or borrow one of the inn’s bikes. You can also borrow a movie from the inn’s DVD library, make use of the fire pit, or take advantage of the outdoor seating throughout the gardens and on the porch. The morning begins with a hot breakfast. Rooms start at $119 per night. More weekend getaways from Chicago. Located in Galena, Illinois, the Farmer’s Guest House features comfortable guest rooms and the separate “Annie’s Cottage” just down the street. Guests are treated to a delicious country breakfast made by Susan Steffan, the “Breakfast Diva,” who has won multiple awards for outstanding cooking. The inn also features a private spa and “wine time” each evening. The staff is always ready to recommend a restaurant or a nearby activity so that guests get the most out of their trip to beautiful historic Galena. Taylorville, Illinois is home to restaurants, shopping and historic sites, including a building where Abraham Lincoln practiced law. The Market Street Bed and Breakfast is the perfect place to stay while taking in all that the area has to offer. The Queen Anne mansion has eight guest rooms, all with fireplaces and private baths. A carriage house just south of the property includes two more suites and off-street parking. Breakfast is served each morning and a social hour with free beverages, cheese and fruit is served later in the day. The inn also offers a romance package and specials for quilters and scrapbookers. 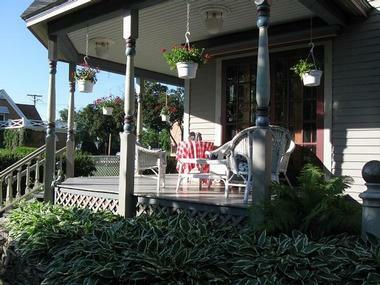 Blessings on State is a peaceful retreat located in the historic district of Jacksonville, Illinois. The bed and breakfast is housed in a 120 year old mansion that still retains many of its original details and craftsmanship while providing modern luxuries such as free wifi, digital satellite television and DVD players. Each suite contains a sitting room and private bath with soft bath robes and spa-quality toiletries. Guests can enjoy a full breakfast each morning or grab a snack or a complimentary beverage any time before heading out to view the beautiful antique mansions that line State Street in Jacksonville. The Victorian Rose Garden is located in downtown Algonquin. 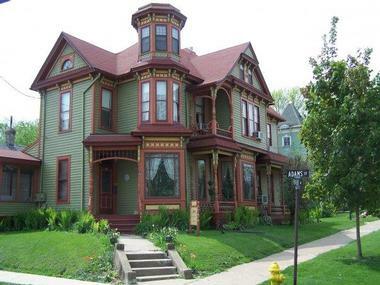 This 1886 Victorian mansion is the perfect place for quiet relaxation. All of its four suites include private baths, cable tv and free wifi. Additionally, the inn has a large porch, a patio and three common rooms for guests to enjoy inside. A hearty breakfast is served each morning and complimentary beverages and goodies are available for guests upon arrival. The inn is close to several restaurants and shops, and the Fox River is within walking distance. Experience luxury boutique lodging and outstanding service at the Beall Mansion located in “Millionaire’s Row” in downtown Alton, Illinois. The Beall Mansion is a bed and breakfast with upscale amenities such as Jacuzzi and fireplace rooms, HDTV with premium movie channels, free wifi, 24 hour hot beverage service, a 24 hour chocolate bar and a spa. With optional in-room massages and breakfast in bed, guests never have to leave their rooms. Though, if they are ready to leave, guests will find no shortage of things to do and see in historic Alton, on the banks of the Mississippi River and just 25 minutes from downtown St. Louis, Missouri. The Steamboat House in Galena, Illinois is a Gothic Revival mansion built in 1855 by Daniel Smith, a famous steamboat captain. The inn features five Victorian guest rooms, a billiard room, library and dining room, and features a wrap-around porch and screened gazebo overlooking the beautifully landscaped grounds. Complimentary hot beverages and a three-course breakfast are served each morning. Wine is on the menu at the Steamboat House, where complimentary wine tastings are held each evening. The inn also offers special packages that include tours and tastings at local wineries and distilleries. Historic charm meets modern sophistication at the Aldrich Guest House. 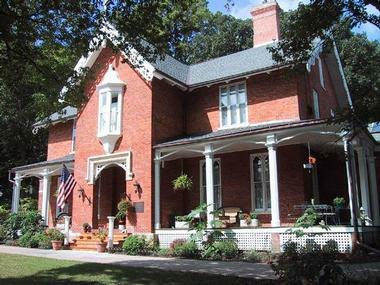 The home was built in 1845 by Illinois Congressman Cyrus Aldrich and has served as a bed and breakfast since 1984. Each of the five guest rooms has a private bath and includes a Bluetooth enabled radio and complimentary wifi. A hot breakfast is served each morning and free wine and hors d’oeuvres are served at 5pm daily. Optional amenities such as a bottle of wine or champagne, chocolates, in-room breakfast or an in-house massage can be added to any booking for an additional fee. 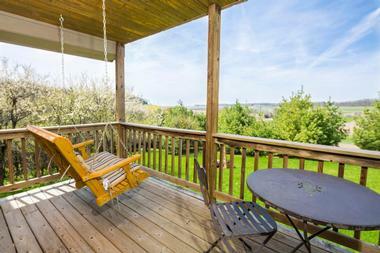 Hawk Valley Retreat and Cottages is a nature lover’s paradise. Located in the peaceful countryside near Galena, Illinois, Hawk Valley contains 10 acres of land with a walking trail, gardens, a pond and beautiful valley views. Guests can choose from one of three rooms in the main house or one of four charming country cottages for their stay. Breakfast, beverages and homemade cookies are included in each reservation. For a truly unforgettable stay, special amenities such as a massage, desserts, appetizers or in-room pizza are available for an additional fee. Hawk Valley is the perfect place for weddings, reunions or a romantic weekend away. The Queen Anne Guest House is a Victorian mansion located in the heart of downtown Galena, Illinois. From the house, it’s just a short walk to shopping, fine dining and historical sights. The inn’s guest rooms are decorated in the Victorian style and all have private baths, satellite tv and complimentary wifi. 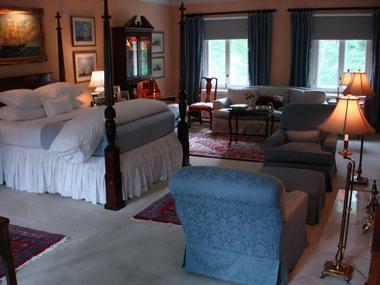 The inn also includes two parlors, a library, a dining room and porches overlooking the beautifully landscaped garden. 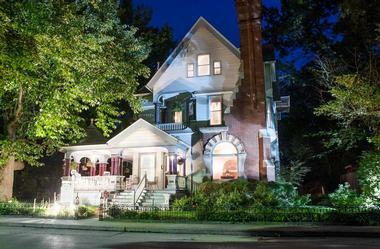 Breakfast at the Queen Anne has been called “the best breakfast in the Midwest” by Arrington’s Inn Traveler Magazine. Guests can even purchase a cookbook of the Queen Anne’s best recipes to take home with them. Bishop’s Hall is located in the historic district of Oak Park, Illinois amidst a group of Frank Lloyd Wright-commissioned homes. Wright’s own home and studio as well as the home of Ernest Hemmingway, are within walking distance. Additionally, Bishop’s Hall is only 15 minutes from the Magnificent Mile in Chicago. Each of the hall’s three guest rooms has a private bath and complimentary robes and toiletries. Complimentary chocolate and fresh flowers are always available. Breakfast is served each morning and can even be eaten outside on the terrace, weather permitting. Outdoor adventure is all around the Fox River Bed and Breakfast. The inn sits on 17 acres on the Fox River near Ottawa, Illinois. Hiking and biking are available at two nearby state parks and the I&M Canal Trail. Guests can rent a canoe to float on the beautiful Fox River, take a ride on a canal boat or bring their binoculars for spectacular bird watching. There is a sky-diving facility just a couple of minutes away. The bed and breakfast has five individually decorated guest rooms which can be booked with or without breakfast included. 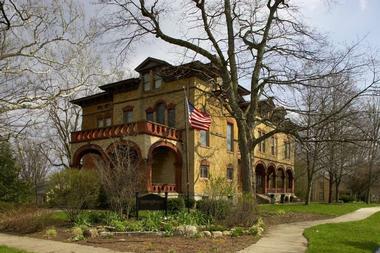 Located in Bloomington, Illinois, the Vrooman Mansion is a massive brick home built in 1869 and decorated in the Romanesque style. It contains common areas such as a parlor, music room, library and dining room, and has five guest suites with luxury down pillows, comfortable sheets and free wifi, snacks and soft drinks. A seasonal gourmet breakfast is served each morning. The Vrooman House is conveniently located near two interstate highways and historic Route 66. History, adventure, and fun are all close by. Guests can explore the history of central Illinois, tour a local winery, stroll through nearby Miller Park Zoo or take a walk down the Constitution Trail. The Timmermann House is a 1940s farm house that has been expanded and converted into a spacious bed and breakfast. 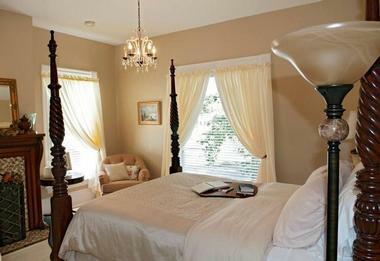 The inn contains two beautiful guest rooms with comfortable beds, luxury linens, plush bath robes and private baths. Room rates include a full breakfast and a two-night minimum stay is required. The Timmermann House is located in the peaceful countryside of Southwestern Illinois near the town of Aviston. The inn is surrounded by fields and even hosts its own farmer’s market starting in April. There is plenty to do nearby, including golf courses, restaurants, a working creamery as well as fishing and boating on Carlyle Lake. You may also like: The Green Tree Inn in Elsah, The Mansion Bed And Breakfast in West Dundee and Hawk Valley Retreat & Cottages in Galena.